Lamps can be made from almost anything. Often people come into our shop and say "Can y'all make this a lamp?" Most often the response is Yes. 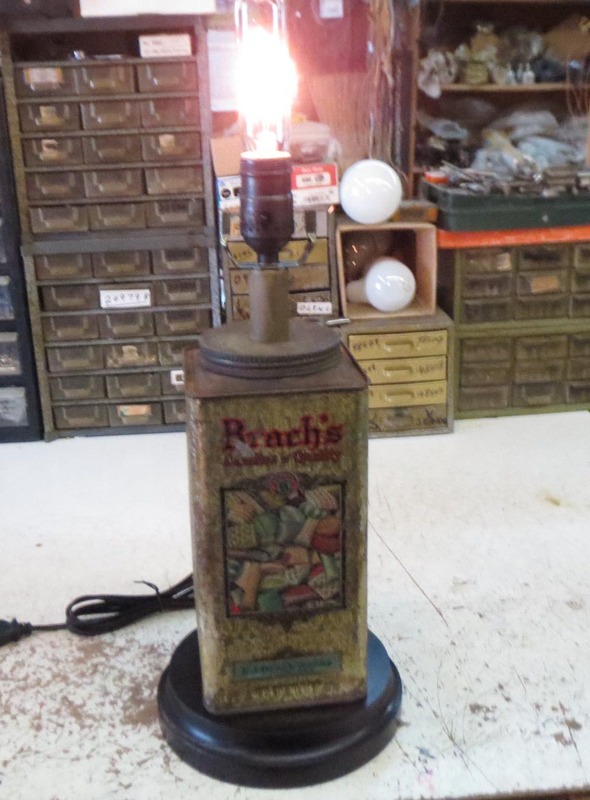 One customer brought in an antique Brach's Candy tin and wanted to make it a table lamp. With the right tools and knowledge anything is possible. Anytime you turn a product into a lamp you have to think about whether the item is going to serve as a structure of the lamp or be an accent piece. A few post back we made a lamp using a Porcelain Rabbit. In that lamp the item was used as an accent piece and placed on a base with a bend tube for the lamp body. For this lamp we will use the candy tin for the lamp body. First thing we do is inspect the tin and make sure it is fairly sound to serve as the lamp body. Them we made a list of our lamp parts needed: lamp base, socket, neck, harp base, threaded rods, nuts, washers and lamp cord. Next we plan for the lamp design. In this case we will not run a rod through the lamp but have the socket attached to the tin top and the lamp base attached to the tin bottom. Since the tin top has a screw lid, we tighten the lid and use tape to mark the closed position. Next we mark the lid and drill a hole for the threaded rod on the lid. The threaded rod is attached to the socket cap. Then we slip on the harp base and the antique brass neck. This threaded rod is attached to the tin top with a large washer and nut. Next we move to the base of the tin where we mark and drill a hole. We attach a threaded rod to a crossbar and line it up with hole using a graduated steel rod. Then we attach the lamp base to the threaded rod and tighten the nut on the threaded rod. Note: This base had a wire hole for the lamp cord so it had a front side and a back. Make sure you orientate the base on the lamp before you make the final turns on the nut. Next we feed the lamp cord up from the base of the lamp to the socket. A UL knot is tied in the cord and the cord is attached to the socket interior. The ribbed wire goes on the nickel screw and the smooth wire goes on the brass screw. The socket shell is slid on the socket interior. The socket is aligned with the harp base and the shell snaps into the socket cap. The lamp cord slack is pulled back down the lamp. The tin top is reattached to the tin. The taped markings are aligned. The tape is removed, a bulb is added, and the lamp is tested. Excellent. Total Cost < $32.00 Total Time < 1 hour.